Thank the heavens, my kids, a 1-year-old pink monster, and a bottle of “Aches & Pains Liquid Mineral Bath,” my two-day pity party has ended. Actually, pity isn’t the right word, or even party, for that matter. There’s not much fun in pity. But is there such a thing as a “feeling-like-crap” party? It’s not very alliterative, is it? It began Wednesday, halfway through my workout. My body hurt and my mind was racing and nothing – absolutely nothing – was in sync. I finally said, “Screw this! I can’t do it anymore,” and I went to Pittsburgh to spend a few days with my daughters and my granddaughter. By the time I got home last night, I was feeling better. I woke up this morning and the crap feeling had subsided and I was able to work out and think clearly at the same time. I even got the grocery shopping (at three freaking stores) done and the porch winterized and the garage cleaned. My reward? A bath. A long, hot bath with my new favorite bath stuff, Village Naturals Therapy liquid mineral bath. I found it at WalMart. Sometimes you find stuff there, you know? Soaking in a hot bath, life just makes sense. My knees feel better, my wrists feel better, my shoulders feel better. I can shave my legs and other parts. I can think and breathe and work the crap out. When I get out, life’s a little lighter. It’s at that point – shaved, dressed and refreshed – when I started writing this blog. I was going to expound on the virtues of mineral baths and positive thinking when Jake the Golden Retriever started barking and I went to the living room to see why. Crap. Two guys were at the front door. They could see and hear me so there was no faking I wasn’t home. Are they Obama or McCain? It’s an innate response anymore, given the way things are this election year. Both campaigns have hit our house (and phone) a lot lately. Wait, I thought before opening the door. Did I put on a bra after my bath? I looked down and saw that yes, thankfully, I did. I shooshed the dog and thanked the gods even a little more when I opened the door and learned the two guys weren’t from a political campaign. They were fraternity boys selling raffle tickets for some good cause or other. Self-deprecating 45-year-old me wondered why do frat guys have to be so damn good looking when I’m smelling of Vicks Vap-O-Rub, have rosy cheeks, and am wearing no makeup and sporting an oh-so-lovely outfit of grey sweat pants and a baggy white shirt with a permanent Claire spit-up stain at the top? You’re 45, you’ve felt like crap for two days, you get to be who you are in this moment, Lynn, I told myself. With just that little affirmation, I felt better. Well, that and remembering that living in a college town, I encounter a lot of students and it’s my civic duty to remind them to be mindful of who they’re interacting with. They can’t be sure if they’re talking to a future professor, or worse, a future professor’s spouse. You really don’t want to piss us off. “What’s your major?” I asked after they gave me their spiel. The first guy answered, “Secondary English education,” and the second guy said, “Microbiology,” like I was going to be all impressed. Perfect answers. If they’d said they were accounting or economics majors, I’d have just given them my money and walked back in the house, telling myself it was OK to look like a total goober in public. “Oh, well, I’m sure you will at some point,” I laughed. Microbiology boy looked as sober as his friend, although I doubt either one was sober last night, being Halloween and all. “You’ll have my husband at some point,” I told him. “Who’s that?” he said, wide eyed. Whenever I tell a kid I’m married to “Dr. Bering,” the reaction is either joy or fear. There’s no in between. I give the guy credit for asking me the question. It’s pretty ballsy to ask the wife of your future prof what she thinks of her husband. I pointed to scary biochemist Larry who was returning home after walking our other two dogs. I gave English major boy my money and he handed me my tickets. He and his friend thanked me and dismissed themselves faster than my Golden Retriever pees on a tree. I sat on the ledge and watched them greet clueless Larry with the guttural, “Hey,” that guys do. I thought for a second about my “feeling-like-crap” party and wondered if those boys knew or would have one themselves. Probably. We all do, right? Doesn’t matter if it’s about food or exercise or college studies, we all have them. I relieved my most recent “crap” feeling with a visit with the people who mean the most to me. As I started feeling better, I used it to conquer a good workout, a yard/garage clean-up and a bath. I make plans and schedules for the week, but they’re all dependent on feeling physically and emotionally normal with nothing extemporaneous intruding. It’s how we deal with the unexpected that plays into our weight-loss and weight-maintenance lives. We could choose to eat and throw it all out the window or we could be rational. Sometimes I throw it away for a moment, but mostly I take a deep breath and think for second. There’s nothing wrong with distracting ourselves or jumping in a tub. You never know what might happen, right? My aches and pains are a little more numb tonight than they were on Wednesday. My mind’s had enough time to sort through the crap. Maybe things will be normal this week. Maybe they won’t. I take comfort in knowing that I will figure it out eventually, come what may. I can only make a commitment to eat well and exercise and listen to my body despite (or in response to) the unexpected. If I screw up, well, hey. I’m a work in progress, right? Here’s my little pink monster grandbaby who makes this commitment a little easier to fight for. This entry was posted in Uncategorized on November 2, 2008 by Lynn Haraldson. Claire is getting so big! 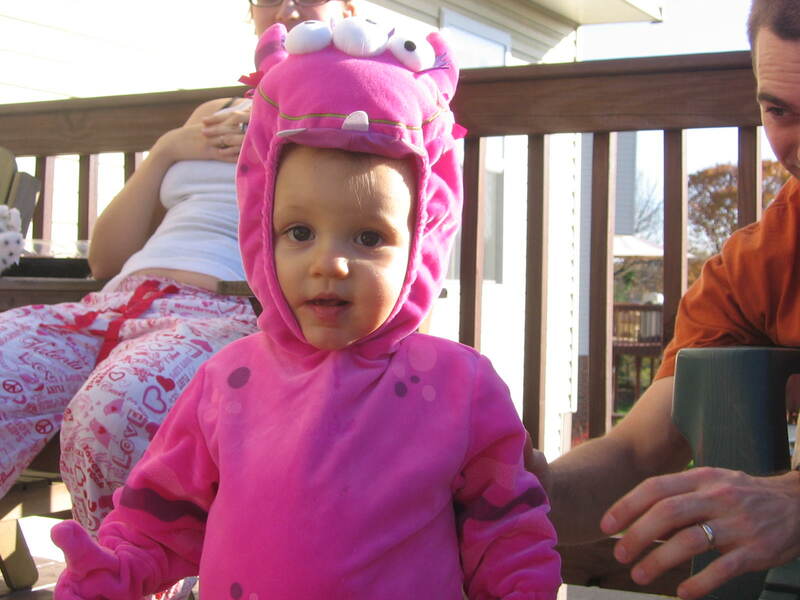 She is adorable in her pink monster outfit. I could relate to the “feel like crap” feeling. I have had a non stop headache for over a week and cleaning up the kitchen seems like a major task. Usually I can kick it out with some Advil or water, but not this time. Nothing helps at this point! Claire is just precious, that little face alone would make me feel better!We’ve had sickies in my house so I’m not allowed to feel like crap right now. Ug! Joy, I’m so sorry you’re feeling so “crappy.” Do you get headaches often or is this something new? Cheri, so glad you liked the PB2! Hope everyone in your house is feeling better soon. This is a great post. Knowing how a “normalized fat person” deals with feeling crappy helps me try to normalize my own responses (from turning to food, to ‘being who I am’ in the moment, enjoying a long bath, or spending time with loved ones). My daughter is sick today, coughing up a lung and crying a lot, and I think I am going to get her down for a nap and take one of those nice, long hot baths myself. Glad you’re feeling better and you had a nice visit. I do that sometimes too just run off somewhere to see my mom or girlfriend or someone. It always seems to help with feeling crappy. Sometimes I just think that’s what it is, that we are missing someone and need to see them. I loved the PB2 also. Wasn’t sure about the chocolate at first taste but now thinking I like it better than the regular lol. Thanks for posting about it.Super cute grandbaby!